Too busy trying to determine if the tentacles are a dealbreaker or not. I mean, she's gorgeous and oh-so-huggable, but... tentacles. Costs: Abilities 76+ Skills 19+ Advantages 14+ Powers 106+ Defenses 20= 235 pts. Arrogance: Salamandra feels that she, and other Transhumans, are entitled all the best things in life, no matter who she, or they, would need to smash to maintain her lifestyle. Motivation ~Transhuman Liberation: Salamandra believes in the Transhuman liberation movement, and seems to despise normal humans. Power Loss: Salamandra must take periodic doses of The Cambion Serum, otherwise she loses those abilities. Relationships: Most of the other members of Black Sun, especially her parents Azul and Tiamat. Background: The youngest child of Azul and Tiamat, Salamandra is proud of the fact she’s part of the first generation born into Black Sun. Although the defection by Draco, her older brother, to the Vanguard is like a stain on her family’s reputation that she feels is up to her to remove by removing him from this world. Salamandra has spent her whole life being indoctrinated by the elder members of Black Sun about how Transhumanity is vastly superior to Humanity in general, and feels that it is their right to take what they need to survive as they have no other means available to do so. A mentality she fully believes to be true, supporting all the various plans and plots the elders of the group come up with no matter the moral questions they include. Costs: Abilities 46+ Skills 15+ Advantages 7+ Powers 105+ Defenses 18= 193 pts. Motivation ~Transhuman Liberation: Blacksmith believes in the Transhuman liberation movement. Power Loss: Blacksmith must take periodic doses of The Cambion Serum, otherwise he loses those abilities. Background: Rebecca Owens grew up believing that Transhumans were treated unjustly for the most part, particularly influenced by the social media efforts of the man known as Encomium. So when her powers manifested she knew that she wanted to use her abilities to help her fellow Transhumans and wasted no time in training herself in their use secretly, and upon reaching her eighteenth birthday she left her family to join Black Sun. In the short time since gaining membership, Rebecca, or as she is known better known Blacksmith, has proven herself devoted to Black Sun’s cause and often part of their field missions. Though it should be noted that while many of her allies are not worried about the collateral damages they cause, or in some cases enjoy causing harm to bystanders who are in their way, Blacksmith is not among either group; instead she will trap them in her creations. Costs: Abilities 52+ Skills 29+ Advantages 21+ Powers 92+ Defenses 33= 227 pts. Motivation ~Transhuman Liberation: Encomium believes in the Transhuman liberation movement. Motivation ~Power: Encomium wants to make sure he is the person in charge of the Transhuman new world order. Power Loss: Encomium must take periodic doses of The Cambion Serum, otherwise he loses those abilities. Background: One of the first generation of Transhumans to manifest, Grant McAllister quietly perfected his powers by using his psychiatric patients as test subjects. Fascinated by the development of Transhumanity, Grant spent much of his personal time researching the ones who felt the need to dress up in flashy clothing and play the part of either hero or villain as well as noting the public’s reaction to them. He theorized, correctly, that the general public would react negatively to the sudden appearance of Transhumans in the population, though he did see an opportunity to make something for himself in that situation. However, to bring that goal to fruition he would need others to help him, others who would want to fight back against the hatred part of humanity sent their way. Luckily enough Grant already knew another Transhuman, one who was lucky enough that she didn’t have any obvious, physical changes to go along with the frightening amount of power she possessed but was suffering from mental issues brought on by her powers. In other words, she was the perfect tool Grant needed for his plan to work, all he needed after that was to find others to join him and her in their endeavor which only required time on Grant’s part to locate the “right” people. It helped a great deal when a new patient was referred to him – Gabrielle Vargas, a newly manifested Transhuman whose appearance had been altered to the point that it obvious to any who saw her that she was more than human with her lower body was transformed into that of an octopi. She also had her intelligence increased to the point that she understood scientific principles and various theories, which was something that Grant saw a need for himself, so he began manipulating the young woman until she was dependent upon him for her mental well-being and in total agreement with his views on the state of Transhuman independence. It was thanks to Gabrielle’s scientific genius that Cibola, the flying island that the Children of Quetzalcoatl would call home, was designed and built. From there, the Children of Quetzalcoatl began their mission of liberation, which quickly put them at odds with American organization C.A.S.T.L.E. and was the reason for the founding of the Vanguard to oppose them. Over the years since their founding the Children of Quetzalcoatl have lost members; some dying while trying to further the group’s goals with others having been incarcerated in similar pursuits, but they have always gained new members as newly manifested Transhumans who have experienced first hand the kinds of atrocities Encomium has always spoken out about and seeks to eliminate from society. Thus, when Xantico died during an raid on Cibola by the Vanguard, Encomium was forced to take the role of leader of the group, which he renamed Black Sun in honour of their fallen leader, he put the group on a more aggressive path to accomplish their goals. Now Black Sun has become considered to be a terrorist organization by the United States Government as they seek out secretly backed government operations and destroy them in an effort to “liberate” their genetic brothers and sisters all so they can found their own independent nation of Transhumans where they can live their lives in peace. Last edited by Tattooedman on Mon Mar 19, 2018 4:56 am, edited 1 time in total. Costs: Abilities 64+ Skills 9+ Advantages +12 Powers 42+ Defenses 23= 150 pts. Loyalty: Obelisk is unquestionably loyal to Encomium and Black Sun. Motivation ~Transhuman Liberation: Obelisk believes in the Transhuman liberation movement. Obvious Transhuman: Obelisk appearance make it clear he’s not human. Background: Michael Jones was among the first Transhumans to manifest his peers in the 1970s, unfortunately as a 16 year old he was ill prepared for the follow backlash from his friends and family and soon found himself living on the streets with nowhere to go and nobody caring. That is until he met Grant McAllister and the older man told Michael about his dream for Transhumans like him who had been cast aside by their loved ones because of things that were out of their control. That honest effort of understanding created a feeling of trust in Michael that has continued on until the current times, as Michael, or as he renamed himself Obelisk, has been a steadfast member of the Children of Quetzalcoatl (and later Black Sun) who has never hesitated to do his best to further the group's goals no matter what. Costs: Abilities 40+ Skills 15+ Advantages 12+ Powers 88+ Defenses 26= pts. Gotta Get Them All! : Abra Cadaver wants to gain possession of as many major artifacts as he can in the hope that he can return himself to life. Weakness: Abra Cadaver is vulnerable (+100%) to Holy Effects. Background: An up and coming professional magician, Blaine Christopher followed the example of his idol Harry Houdini by becoming a well known debunker of mediums and others who used “magic” and superstitions to con people out of money. He was also fascinated by the idea that magic was real, spending hours of time trying to find “real” magic which led to him gathering a small collection of supposed minor artifacts. What Blaine didn't realize that one piece of his collection was in fact a real artifact - a flawed Second Chance Ring. Unknowingly he took to wearing it while he performed, thinking of it as a good luck charm. Unfortunately for him it wasn't and he died while doing a 24 hour submersion stunt only to wake up a few hours later in the city morg. The following days were then spent going through page after page of lore Blaine owned until he pieced together what had happened. Now seeking to undo his transformation into one of the undead, Blaine seeks out powerful artifacts to fuel a ritual to return himself to life. Last edited by Tattooedman on Mon Mar 19, 2018 4:57 am, edited 1 time in total. Black Sun is an interesting group, persecuted minority yet trying to obtain their goals by such means makes it hard to sympathize. Blacksmith is my favorite out of them, interesting ectoplasmic powers. One thing of note, Encomium's Toughness is off by RAW, as Protection from equipment can't stack with powers, only the highest ranked counts. And Abra Cadaver is one creepy undead villain, surprised he isn't a part of the Brimstone House with all the aid and resources he could gain. Black Sun is an interesting group, persecuted minority yet trying to obtain their goals by such means makes it hard to sympathize. Basically they're my setting's answer to Marvel's Acolytes, so I tried to make them hard to agree with even though their message was a good one. Blacksmith is my favorite out of them, interesting ectoplasmic powers. She's one of my favorites out of the group, and actually one of the last characters added to the group. I love the idea of her power personally - as she's a kind of psychic but it isn't easy to figure out since she's self taught in the use of her powers. One thing of note, Encomium's Toughness is off by RAW, as Protection from equipment can't stack with powers, only the highest ranked counts. You'd think that by this point I'd remember that, thanks for reminding me. I'm seeing him as a bit paranoid, which isn't too surprising given how messed up in the head he is given what's happened to him, so being part of a group really isn't going to appeal to him no matter what benefits a membership might grant him. So far there's a good spread of villain groups, but we're lacking the whole technological/mad-scientist consortium. Is that not part of your plans yet? I have a couple tech themed groups in the works, I just haven't worked out all their details yet. But I am about halfway done with them, I'm just clearing out some of the other builds I've gotten done thanks to my build ADD. Costs: Abilities 96+ Skills 29+ Advantages 8+ Powers 127+ Defenses 22= 282 pts. My Past Doesn’t Matter: Archein’s manifestation of his powers caused so much mental trauma to him that he has completely forgotten his life before that moment. While in general he doesn’t really care about that past, he sometimes wonders about the person he used to be. Motivation ~Savior of Transhumanity: Archein seeks to "save" other Transhumans from the hardships he feels awaits them in the world. Background: The man now known as Archein is considered to be amongst the most powerful Transhumans in the United States, but virtually nothing is known about his past. Though there is good reason for that, Archein himself doesn’t even know it. Born Daniel Michaels, he was the son of a Lutheran pastor who strictly raised his son according to his religious beliefs. Adding to his troubles, Daniel was a scrawny boy whose interests were more of a more cerebral and artistic than those of his peers, something that forced him to be the brunt of many cruel jokes and pranks in his Southern hometown. At the age of sixteen Daniel's powers manifested during one of those pranks, causing him to undergo a total body transformation: his slight frame became a physique that rivaled a professional quarterback’s while his features turned into something straight from the cover of a romance novel. Unfortunately, a side effect of the extreme physical changes along with the manifestation of the energy that was now his to command, which scorched a fifty-foot circle around him, was a mind-numbing amount of pain. So much that it traumatized Daniel to the point that he was afflicted with amnesia and lost all memories that pertained to his personal life. While he couldn't recall any specifics of his life, the young man formerly known as Daniel, was haunted by the feeling of being persecuted his entire life. He also understood that he was now a powerful being, one who could use his powers to make a difference for others in the world that had been treated like he believed he had been - Transhumans. Naming himself the Archein, he set out on his self-appointed crusade to save his genetic brethren. 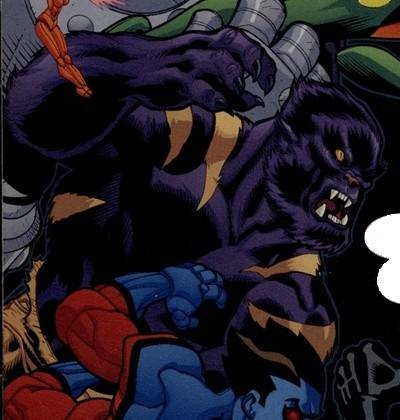 This has led to Archein being labeled as a super villain as he's become the opponent of organizations like P.U.R.G.E. and Ghostworks; using highly destructive tactics that leave massive amounts of collateral damage in his wake. This has brought him into conflict several times with the both the Vanguard and the Alliance, though Archein has always managed to escape capture. Last edited by Tattooedman on Sun Mar 25, 2018 12:47 am, edited 1 time in total. Neat. So Ghostworks is one of those rogue tech groups, as from Emerald City? Actually no. I'm using the name for a rouge government faction that tries to weaponize Transhumans. Costs: Abilities 66+ Skills 23+ Advantages 11+ Powers 54+ Defenses 26= 180 pts. Motivation ~Thrills: Leo enjoys being part of the super scene. Power Loss: Leo must be able to speak and gesture to use his magical abilities. Prejudice: Leo is covered from head to toe with dark indigo with yellow stripped fur, so he tends to stands out in a crowd if he doesn’t disguise himself in some way. Temper: Leo’s animalistic side can cause him to get worked up from time to time. Background: Leo Zard always had an interest in magic and by the time he was in his early 20s he was considered one of the more well versed knowledge-wise in the mystical community despite his inability to cast magic aside from ritual workings. Leo eventually grew tired of acting as an information resource for others, wanting power for himself he devised a ritual that would give him what he felt he'd long been denied. For almost two years Leo collected the items he'd need for his working; the wings of a pegasus, a unicorn’s horn, pixie dust, and a werewolf's heart. Then he had to wait for the right planetary alignment to cast his ritual, which came seven months later. Unbeknownst to Leo, he'd made a mistake - he'd not needed the heart of a werewolf, but rather the blood inside that organ. This miscalculation changed the ending effect of the ritual and Leo found himself turned into a half wolf-like creature. Although, he'd still had gained the spell casting abilities he’d intended so he thought it was a fair trade in the long run. However, those in the mystical community were smart enough to realize the mistake he’d made as well as the items his ritual called for and that got him blacklisted by those Leo had once done so much work for in the past. Not that Leo really cared by this point as he’d gained what he’d always wanted, so now he is more than happy to take whatever he wants or needs. Costs: Abilities 62+ Skills 12+ Advantages 7+ Powers 46+ Defenses 12= 139 pts. Burning Bright: Undertow’s energy generating powers can build up inside him, causing him great pain unless he periodically releases some of it. Sins Of The Father: Undertow’s father is the original Mariner. That isn't a good legacy to be attached to. Temper: Containing the constantly burning energies inside his body have left Undertow on the edge of lashing out at others in anger with little provocation. Background: One of several children fathered by the aquatic radical, the Mariner, Alexander Davidson was raised by his mother's family so that his father had no influence on him. Unfortunately for the Davidson family Alexander inherited his father's altered genetics and in his early teens began manifesting his powers, which led to his being discovered by members of the Vanguard. This led to Alexander being enrolled in the Vanguard Academy to help him understand and control them. Some of his teachers aren’t convinced they were successful; Alexander always had problems with authority as well as problems controlling his temper. Although he graduated he was not offered membership in the Vanguard, which didn’t bother the young man all that much as he had no interest in joining that group in the first place. Instead he was content to wander where the coastal waters took him. So far he’s managed to stay out of trouble, but he’s made comments about trying to locate his father, and how that family reunion will play out is anybody’s guess. Last edited by Tattooedman on Sun Sep 09, 2018 12:55 pm, edited 2 times in total.